Chicago Cubs reliever Pedro Strop has a strained right hamstring, eliminating the likely candidate to close at the start of the season as Brandon Morrow recovers from elbow surgery. Strop, a 33-year-old right-hander, felt a hamstring issue on his last pitch Saturday against the Los Angeles Angels, his second appearance of spring training. An MRI on Monday revealed a mild strain. The Cubs said Strop is able to play catch but will not participate in game-related drills during the next week. "The trainers are very optimistic," Chicago manager Joe Maddon said Wednesday. "He's still able to throw at a great distance. Whenever you're able to keep your arm working, that matters." Morrow, a 34-year-old right-hander, had arthroscopic surgery on Nov. 6. He did not pitch last season after July 15. "This guy has closer stuff," Maddon said, also pointing out "he's so good at shutting something down in the seventh or eighth, and I would not run away from that." St. Louis pitcher Carlos Martinez will begin the season on the injured list as the two-time All-Star tries to work his way back from shoulder weakness. Martinez will not appear in exhibition games. He is to throw on flat ground for the next week before moving to a mound. St. Louis has not announced a timetable for Martinez's arm strengthening program. The pitcher received a platelet-rich plasma injection two weeks ago, and manager Mike Shildt said treatment improved Martinez's condition. A 27-year-old right-hander, Martinez was the Cardinals' opening day starter last year but did not pitch for St. Louis from May 8 until June 5 because of a strained right lat muscle, then was out from July 19-30 because of a strained right oblique and between July 30 and Aug. 21 because of a strained right shoulder. When he returned, he pitched out of the bullpen and had five saves. He finished 8-6 with a 3.11 ERA in 18 starts and 15 relief appearances. Chicago optioned top prospect Eloy Jimenez to Triple-A Charlotte in a widely anticipated move. By keeping Jimenez in the minors for 20 days, the optional assignment will count and Jimenez would not be eligible for free agency until after the 2025 season. Bryce Harper went 0 for 2 against New York opening day starter Masahiro Tanaka in his third spring training game since signing baseball's biggest contract with Philadelphia. The slugger is hitless in three at-bats and has walked three times overall. Tanaka allowed two runs, six hits and struck out six over 3 2/3 innings. J.T. Realmuto and Scott Kingery homered for the Phillies. Giancarlo Stanton went deep for the Yankees. Opening day starter Jon Lester gave up seven runs, seven hits and two walks in 2 2/3 innings, raising his ERA to 9.53. Anthony Rizzo hit his second home run. Nick Hundley hit a solo homer and Khris Davis added a two-run double for Oakland. Mike Fiers gave up five runs and eight hits in 3 1/3 innings. Noah Syndergaard allowed two hits in 5 2/3 shutout innings with five strikeouts and two walks. Robinson Cano hit his second homer, a two-run drive off Gerrit Cole, who allowed four hits in 4 2/3 innings. Derek Fisher drove in the Astros' run. Joey Rickard had a two-run single for Baltimore. Andrew Cashner allowed three runs, five hits and two walks in 3 2/3 innings, leaving him with an 8.64 ERA in three starts. Marcus Stroman, scheduled to start Toronto's opener, struck out six in 4 1/3 innings and allowing one run and two hits. Eric Sogard had a two-run single. Byron Buxton hit his fourth home run — a solo shot — and doubled for Minnesota. C.J. Cron hit his first two doubles, and Jose Berrios allowed two runs and four hits in 3 1/3 innings. Blake Swihart had two doubles and two RBIs for Boston, which has lost seven straight. Tate Matheny, a son of former Cardinals catcher and manager Mike Matheny, had a two-run triple. Nathan Eovaldi pitched three innings and allowed his only run on Buxton's homer. Ronald Acuna Jr. had three hits for a second straight day, finishing a home run shy of the cycle and driving in two runs for Atlanta. Acuna is 8 for 8 with a walk in his last three games. Tyler Flowers added a two-run homer. Patrick Corbin gave up three runs, six hits and two walks in four innings. Trea Turner hit his first home run, a two-run drive, and Adam Eaton, Juan Soto and Brian Dozier hit solo homers. Jose Urena allowed one run and two hits in four innings. JT Riddle had two hits. 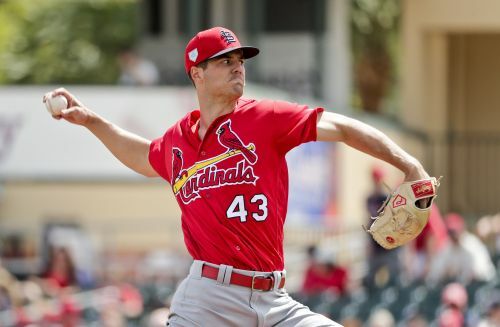 St. Louis rookie Dakota Hudson, bidding for a starting job, allowed one run, two hits and three walks in three innings. Jake Bauers hit a three-run home run and a two-run double. Jorge Soler hit his fourth home run and doubled for Kansas City. Alex Gordon had three singles and two RBIs. Brad Keller surrendered three runs and four hits in four innings, and Ian Kennedy gave up four runs and seven hits in three innings. Trevor Bauer struck out 10 in 4 2/3 innings, allowing three runs and four hits in his fourth start. Hanley Ramirez had a two-run single and Jose Ramirez doubled and singled. Keston Hiura, Milwaukee's top prospect, hit his third home run, a three-run shot off Bauer, and Roberto Perez homered for the first time. Chase Anderson gave up four runs, five hits and two walks in four innings. Charlie Blackmon hit his first home run and Trevor Story hit his second, and David Dahl had two doubles and a single. Kyle Freeland gave up three runs and four hits in four innings while striking out six. Matt Szczur hit a two-run home run. Wilmer Flores hit his third double and is batting .455. Austin Hedges homered twice and drove in five runs. Franmil Reyes had a two-run shot for San Diego, and Chris Paddack struck out six in four impressive innings. Seattle left-hander Marco Gonzales went 2 2/3 innings in a tuneup for his first opening day start next Wednesday against the Oakland Athletics in Tokyo. Gonzales allowed four runs and five hits with three walks and five strikeouts. Ryon Healy hit a two-run homer and an RBI double for the Mariners, set to leave for Japan on Thursday. Ichiro Suzuki went 0 for 2 with two strikeouts and is batting .080 this spring. Preston Tucker went 2 for 2 with two RBIs for Chicago. Cody Bellinger, Enrique Hernandez and Russell Martin homered for Los Angeles. Ross Stripling did not permit an earned run in 3 2/3 innings.